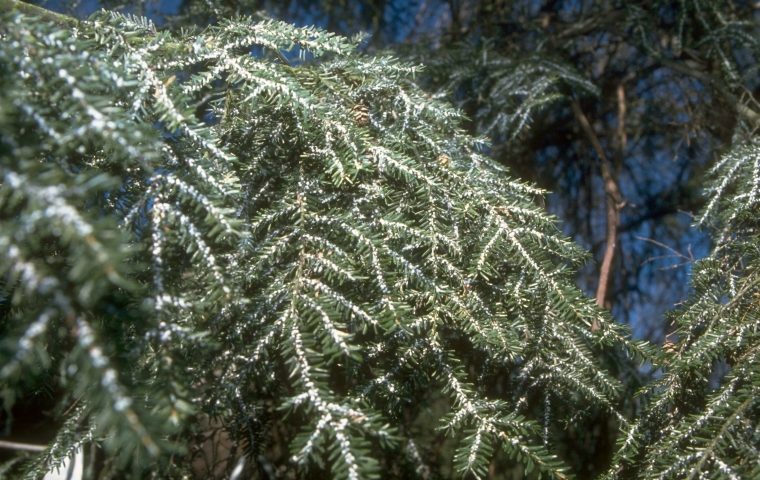 The Eastern hemlock is one of the most abundant trees in New York and a major component of the forests in the Lake George – visible in nearly every corner of watershed. Hemlock stabilize streambanks and shorelines, protect water quality of the streams that flow into the lake, and provide value to local forest products economies. 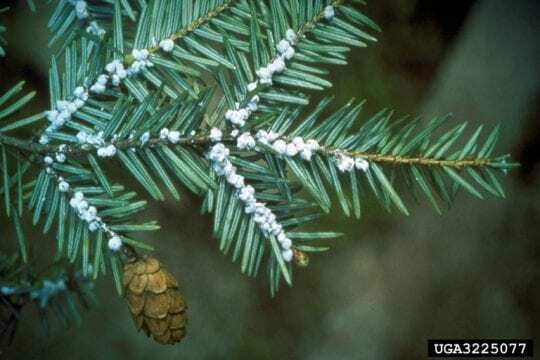 But last summer, a small population of hemlock woolly adelgid was found on Prospect Mountain in Lake George. 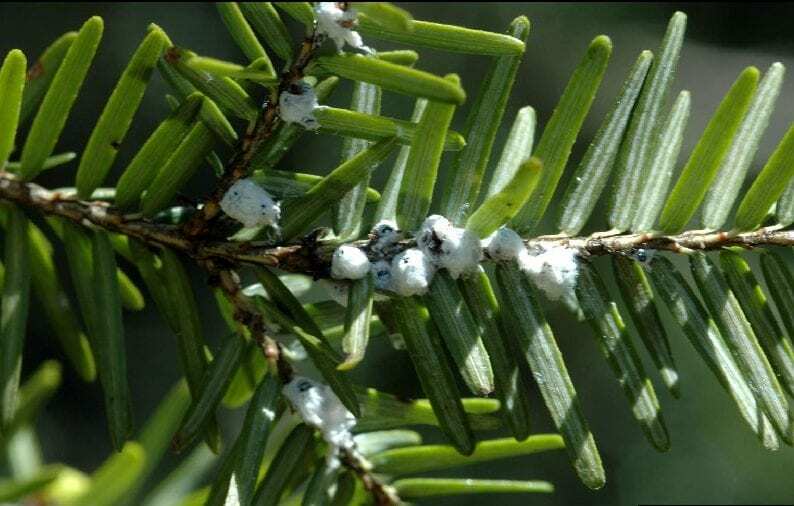 The terrestrial invasive insect, native to East Asia, has been killing large swaths of hemlock trees from the Great Smokey Mountains to the Catskills and is making its way north, having finally reached Lake George. 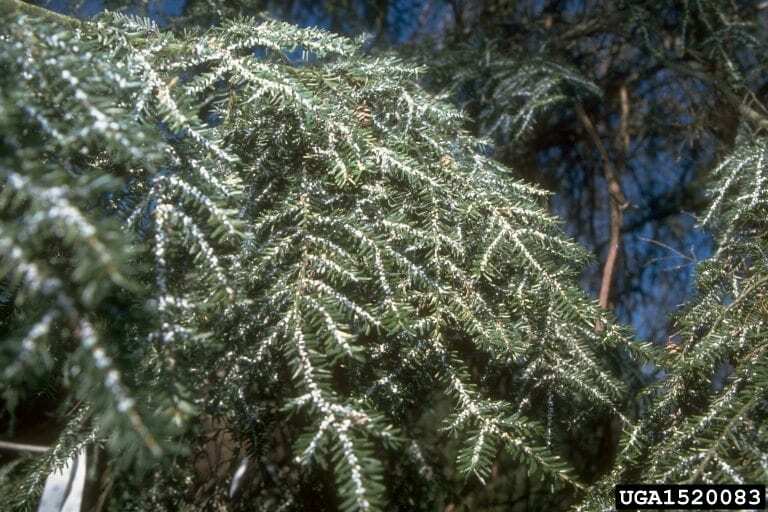 Hemlock woolly adelgid (HWA) was first discovered in the 1980s. It spreads primarily by “hitch-hiking” on birds and other animals. Our extreme cold can help slow its spread, but cannot eliminate the it completely. According to staff of the Lake George Land Conservancy (LGLC) who have been working on the problem, once HWA is discovered, insecticides can treat infected trees, but it’s costly and labor-intensive, and its success depends on early detection. Alternatively, biological controls are being developed, including beetles and flies that are natural predators of the HWA, though creating populations large enough to make a difference is expected to take time. 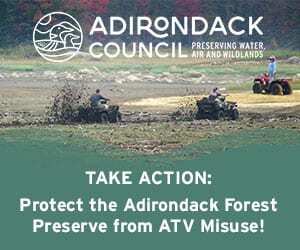 In October, a community workshop in Hague put together by town officials to discuss the issue included the LGLC, the Adirondack Park Invasive Plant Program, the Adirondack Mountain Club, and Professor Mark Whitmore of Cornell University, who is working to develop the bio-control that may help to manage the HWA infestation in the future. At the LGLC, they are hoping to work with other local partners, including the Fund for Lake George, Lake George Association, and towns around the lake to host additional workshops for municipal leaders as well as residents and other community members. The LGLC is working with the S.A.V.E. Lake George partnership to raise awareness and seek funding. The LGLC is one of the largest landowners in the Lake George watershed. This winter, their land steward began surveying its preserves, focusing on stands along stream corridors and wetlands. HWA infestations can be most noticeably detected by the small, white, woolly masses produced by the insects that are attached to the underside of the twig, near the base of the needles. Volunteers are also being trained to survey trails and other lands on iMapInvasives, an invasive species database and mapping system accessible to the public. The scope of this early detection work is enormous, and volunteer help is considered crucial. The LGLC plans on hosting and supporting additional training workshops, to increase the number of volunteer monitors. Volunteers are needed to monitor 4,200 acres of LGLC lands, with hopes monitoring can spread to an additional 3,200 acres LGLC manages for the DEC, and possibly other DEC land as well (with permission). By the end of this winter, LGLC staff are expected to have the necessary credentials to apply treatments to infected trees and the surrounding area of its own land. The LGLC cannot treat private lands or DEC land, but are expecting to alert its partners if any HWA outbreaks are found there. LGLC staff said they are also looking into ways to provide habitat for the biocontrol predators, as well as cones and stock for hemlocks so that if an outbreak occurs on protected land, new hemlocks can be grown to replace those that die. For more information about HWA and the research being done by Cornell University, visit their website, or click here for a calendar of upcoming opportunities for Forest Pest Identification and Survey Training. Inquiries and questions about the HWA or LGLC’s efforts may also be directed to the LGLC, at (518) 644-9673 or shoffman@lglc.org. Photo: Hemlock with HWA egg masses, courtesy Connecticut Agricultural Experiment Station. Do the “other animals” on which HWA hitchhike include humans and their associates such as dogs? If so, that might explain why Prospect was first. Or is that possibility small compared to birds, etc. ?